Outdoor weddings are wonderful........when planned properly. For some reason however I've had a lot more conversations lately with brides-to-be regarding outdoor events and, more specifically, some of the pitfalls of tent setups. I thought it deserved some attention so here goes. (WARNING: Boring techie stuff follows but stick with me, this stuff is important) We do a lot of tent events and I have to be honest, I usually pull onto the property, cringing because I don't know what I'm up against (power-wise). Let's cover some basic dos and don'ts for powering a tent-based Wedding Reception. For a visual, here's an event we did in Manchester, back in March, 2012. As you can see, it adds up quickly. The setup above is fairly modest and uses three full circuits. On the pictures included, our DJ setup included sound, dance-floor effects lighting, 20 perimeter uplights, and 2 Lekos (the gobo pattern at the top of the tent). And that doesn't even count catering or the Photobooth. Here's a shot from an event we did in June, 2012. This included sound, dance lighting, 20 perimeter lights (hung from the roof-line of the tent), dance lighting and the tent company hung 6, Par64 incandescent cans. These units alone were 500 watts each, or 3000 watts (2 circuits). This entire setup ran off 3 circuits with a generator on-site as backup, in case of failure. By the way, side note here, if you're doing Uplighting (colored perimeter lights), be sure and have the Uplighting contractor coordinate with the tent company. In this case the tent company had too many lights and used yellow gels, which clashed and washed out the gorgeous red Uplighting the bride had requested. 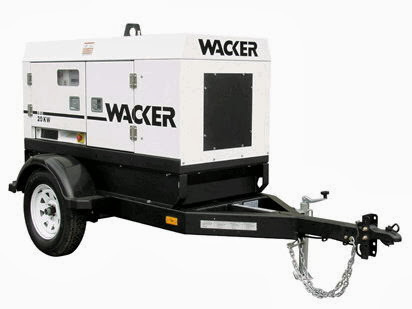 There are two ways to get power to a tent setup; land power or generator. Let's cover generators first. In short, DO NOT USE THIS TYPE! It's okay for incandescent lights, coffee makers, etc. but DJ gear (computers, audio, controllers) will go nuts. You do want your entire first dance song to play without stopping, right? 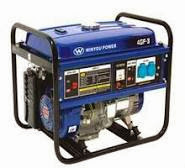 Keep in mind also that these smaller generators only have about a 3-4 hour runtime. There's nothing worse than having a couple hundred of your closest friends standing in total darkness while dad is out trying to re-fuel and restart the generator. And that's not even to talk about the fact that this probably won't even be enough to power the entire setup either. In the Nashville area Art's Pancake Rent-All is a good source. You'll want something that has a fuel tank large enough to power your entire event at full load for twice as long as you're planning for. These pull-behind units typically will have a break-out panel (multiple circuits) and a couple hundred feet of cabling with it. This lets you put the generator out of ear-shot of your guests and puts the power where it's needed (without a bunch of extension cords). Land Power Wherever possible, we always recommend land power to be used as it's more reliable but you need to be aware of extension cords. Never run more than a couple hundred feet of extension cords and never use anything less than 10 or 12-gauge wires. If you pull 16 or 18-gauge cable (the common orange extension cords you use for the weed trimmer) that far, the voltage will drop and that's what burns up electrical gear of all kinds. Bear in mind that you'll need multiple circuits and no, you can just put a multi-strip on the end to power everything in the tent. If you're doing it right, the extension cables should remain cool. If you're overloading them, they'll get hot and that usually means the circuit will fail at some point during the evening (remember that guest in the dark pic?). One other little "gotcha". Getting proper voltage at the end of the line is important. After everything has been wired up, use a volt meter to make certain you have the right voltage. Good voltage is anywhere between 115 and 124 volts. If your tent power is dipping below that, you may be in for trouble. This is often caused by using too-light gauge or too-long extension cords. Uplighting (another "gotcha") As a side note, I wanted to address something specific to Uplighting issues. There are two ways to do perimeter lighting on tents. Hang the fixtures at the tent roof-line and shoot the color onto the roof or use sidewalls on the tent and paint the walls from the ground up. In the case where sidewalls are being used, be sure to stake the walls into the ground. First off, it keeps rain off the lighting fixtures (we lost a fixture due to rain on the purple job above) and it keeps the color hitting where it's suppose to. Drainage Issues You need to be careful when selecting the location for your tent. Of course, you'll want a good, flat surface but something most people miss is drainage. Be sure and survey the area just after a heavy rainstorm. Is there water running through the area where you want to put the tent? Pick someplace else to put it. Water running through your tent not only makes for muddy shoes (and unhappy guests) but it can also be dangerous if you have electrical cables running across it as well. Better safe than sorry. Summary If you've made it this far and are still awake, congratulations! You are in the minority that is doing diligence and that is the first rule of pulling off a successful outdoor event. If all this techie mumbo-jumbo is confusing, don't worry. It is for most people. That's what you hire the pros to help you with. If there are any questions we can ever answer for you, even if we're not doing your event, please call or email anytime. We're always here to help. DISCLAIMER615DJ is NOT a licensed electrician and makes no claims to such expertise. The article above is offered in the spirit of helpful advice, from the DJ's perspective. We recommend you seek the advice of a competent, licensed professional for your electrical wiring needs. There is a romantic eeriness about caves. Yes, something strange and frightening about going down into the earth surrounded by rock walls into natural halls that have been carved out over centuries by underground rivers. Formations of stalactites and stalagmites decorating the neutral interior create a natural Feng Shui as the path winds through this cavity in the earth. Yet, there exists a quiet, peacefulness that allows a place of refuge for awhile. Kari and Nick chose Lost River Cave for their ceremony and reception. White chairs on the banks of the river, created an aisle for Kari's entrance. The wooded area provided a natural cathedral for this real life fairy tale. After portraits, the couple made their grand entrance into the historic Cavern Nite Club, located in one of the largest cave entrance areas in the United States. The up-lighting on the cave walls added charm and elegance. When Nick took Kari into his arms for the first dance, there was magic in the air. It was obvious they were meant only for each other forever. After dinner and visiting with guests the couple moved to the cake table and put on bibs! There were lots of giggles and laughter as these two weren't afraid to get a little messy with the traditional 'feeding of the cake.' Then there was dancing! Congratulations Kari and Nick!!! Samantha and Corey's wedding day was beautiful! They chose Opryland Hotel for their venue. The Bridal suite overlooked the conservatory from the top floor and offered ambiance and natural light. The day was full of smiles as Samantha and her Dad walked through the garden to the Gazebo. Corey and Samantha exchanged vows with family and friends in attendance. After formal portraits, Corey and Samantha enjoyed romantic moments by the waterfalls for a few images before their Grand Entrance into the Magnolia Ballroom. Check out their wedding day. Congratulations Samantha and Corey. A perfect example of "going cheap"
I debated on whether to write this or not. I know that in our industry, it's common to "not rock the boat" and just keep your mouth shut when things aren't right. Call me un-diplomatic but a recent event just got to me and I wanted to share in regards. I know you brides get bombarded with vendors who tell you "don't go cheap". I'm sure that many of you think we're just trying to pad our pockets but I'm here to tell you, that's not the case. Most of us genuinely want the very best for you and your event. I had a recent event at The Factory at Franklin. My event was in the commons area with about 150 guests. Very tasteful, elegant and the Bride & Groom and their guests all had a wonderful time. Now I have no idea who this DJ is, how much they were paid, or what their contract called for. Hey, at least he did change out of his jeans into a pair of Docker pants (same shirt) for this very formal event. Now don't get me wrong, I'm not taking shots at the DJ or the bride. I'm sharing this to show what a poor choice can mean to and otherwise stellar event. The sound system appeared to be a Fender Passport. Not bad........for a Ceremony with 50 guests........but it's absolutely ridiculous to think about using this for a 10,000 square foot facility. It's like trying to use a boombox at a basketball game. My best guess is either the bride went with a cheap $300-$500 guy or some DJ ripped off a client (shame on you, Mr. DJ). The point is obvious. Brides, PLEASE don't go with the cheapest option you can find. Not only on DJ, but for EVERY vendor you hire for your event. This is, most often, the largest party you will ever give for your family and friends and will likely set the tone for how they perceive (and treat) you in years to come. Do you want their respect? Then show them you are a quality individual and always go with quality that gives good value. Thanks for letting me rant. Erin and Nathan said their vows and hosted their Wedding Reception at The Factory in the Commons Area. The couple exchanged their vows in a touching Ceremony in front of the beautiful staircase. At the end of the ceremony, the room was turned over and setup for the Reception. It was a fantastic evening and we wish our lucky couple all the best in the future. Stones River CC was the setting of Abby & Brad's Wedding Reception and what a great event it was! I always LOVE visiting SRCC. Their staff is fantastic and Becca, their event coordinator, knows exactly how to make it all come together. The turnout was a bit larger than planned and they ended up with close to 300 guests. The Live-Pics and Texting was an especially big hit with the guests and they kept us hopping all night. Towards the end of the night, we had a real "Top Gun" kinda moment when Brad took the microphone and he, along with all of his buddies sang "You've Lost That Loving Feeling" to Abby. Christy & Eric exchanged vows at the private residence of the groom's parents. The structure is very interesting with a very high ceiling in the main room. Our couple exchanged vows privately, with only the family in attendance. A bit later they were joined by other family and friends for the wedding reception. As the DJ, I have to say this setup posed a bit of a challenge but nothing we couldn't handle. Since space was an issue, they asked us to setup on a pool table (with the top covered of course) that was located off in a side room. Of all the events I've worked, this has to be the first pool table setup ever. We ran speaker cables into the main room and tucked the speakers right up against the wall. We also used a simple t-bar lighting system as well as one Leko light for a center-floor pattern gobo. This is Brooke & Chad's wedding reception held at the Country Hills Golf Course in Hendersonville, TN. This venue is fairly unknown to the wedding community, but has an excellent facility for parties up to 125. The banquet hall was decorated beautifully and I love the new checkboard dance floor they've installed. Many of the family members were from out of town and our bride's dad is a pastor at a local church. The bride-father dance was unique. They did a "fake dance" where we start off with a slow song and then during the first chorus we edited in some dropouts, then pretended like it was a technical snafu. Once the track drops out completely, the DJ dives under the table as if to fix something. The track "Apache" then came on where our Bride's dad donned his Indian head-dress for a choreographed routine which included the rest of the Bride's family before it was over. It went over spectacularly well and everyone had a great time the rest of the evening. These guys are an adorable couple that have been dating since they were just kids and they decided to exchange vows at Jodi's grandfather's home. The Ceremony was held out in the open with the reception under a large tent. I have to admit, I'm always tepid with tent weddings. Too often, they're under-powered or use the wrong kind of generator (non-inverter style) and that causes all kinds of issues for us. Fortunately, Jodi's dad did an outstanding job of planning and everything was setup perfectly. Jodi had requested red Uplighting for her event and given there were no sidewalls, we hung the fixtures from the tent ceiling. The temperature was a very hot 97 at the start but as soon as the sun went down, things cooled off nicely.....while the dance floor heated up. Thanks to Penn for handling Photobooth tech duties. Everyone had a great time with it. Thanks also to our friends over at B&B Portraits and their great crew. Give her a kiss, Larry! Jake & Beka were married in Bora Bora at a private ceremony so we were asked to provide a screen and projector to show a special video of the ceremony. Food was provided by HGC and Monica handled all the details of the event. HGC always does a fabulous job on weddings and we love working out there. This evening was perfection, with a nice gentle breeze blowing across the pavilion. A great time was had by all.